Easy to grow, delicate, 'silky' blooms of glistening white which shimmer in the sunshine. Perfec..
Beautiful, ethereal, papery white flowers that unravel like crumpled silk. Some calls it Thorny sister of Poppy, because stems and leafs are thorny. Each flower does not last long, but they come in a continual supply. God cut flower as it has long vase life. INDOORS: Sow from February to March in trays of seed compost. Cover with a fine layer (3-5 mm) of compost. Firm gently and keep moist. They need some light to germinate. Cover with glass or clear plastic. Keep at approx. +15-+20C. Plant out when the frosts have gone and space to two feet apart. OUTDOORS immediately after the last frost (till end of May) in a prepared seed bed, in flowering position. Press the seeds firmly into the ground and lightly cover. Keep the area weed free and lightly watered. 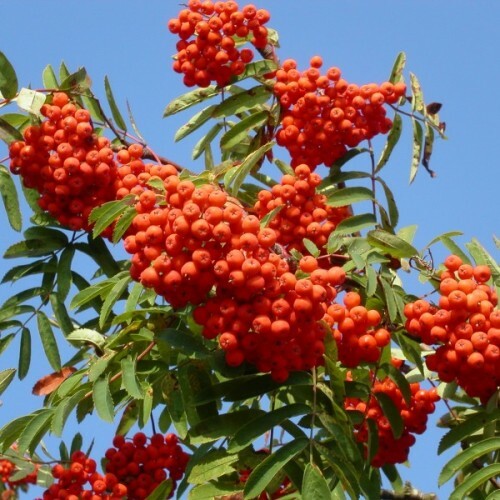 European mountain ash is a small to medium-sized, rounded, deciduous tree native to Europe, Sibe..
Noble, majestic and impressive in form and stature, the Atlas cedar is one of the most heat and .. The clarkias are some of most beautiful flower plants.A charming mix of bright, upward facing fl..